I’m not an ordained pastor, but I am a minister of the gospel of Jesus Christ. When I met Earl, I didn’t know Jesus and had no desire to meet Him. I continued to fight His presence the first four years of our marriage. Then I went on a Walk to Emmaus where I accepted Jesus’ love and forgiveness. Eight months later, I was paralyzed in an accident. After rehabilitation at the number one spinal cord injury rehab in the United States, I became very depressed. I withdrew for hours, sleeping or just hiding behind veiled eyes. I begged God, “Please, at least heal my hands so I can take care of myself.” Instead, He began a ministry of teaching and speaking to small groups. A monthly Sunday school teaching led to teaching every Sunday. A young women’s Bible study, a weekly prayer group, and a daily telephone ministry with women who couldn’t attend Church followed. 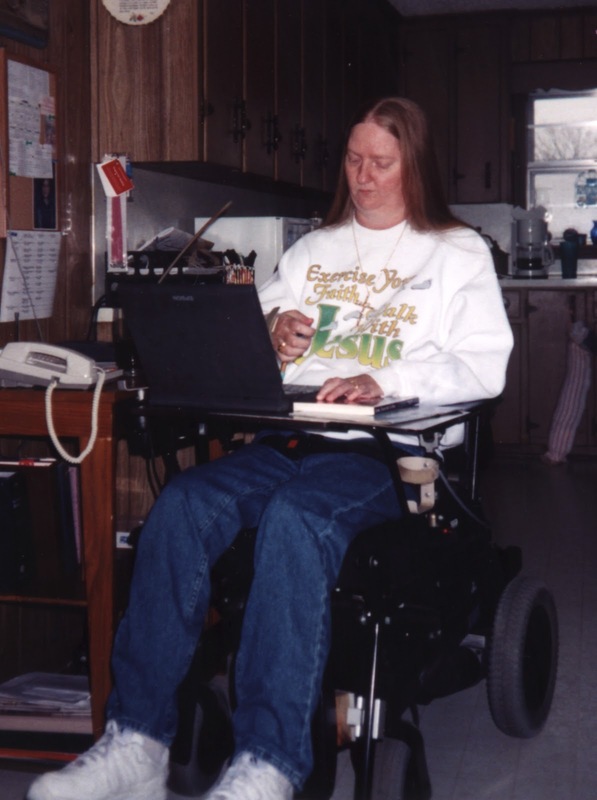 Soon I was president of the women’s group, chair of the evangelism committee, and chaired the conference-level disability team. I’m a certified lay speaker and have filled the pulpit, testified before both large and small groups, and spoken before the pastors, laypersons and members of our regional conference. Acceptance not just of my disability but also my abilities came through ministry to others and by allowing others to minister to me. I’m well known in my Church and secular communities for telling people what Jesus has done for me. I remember the first person I saw in a wheelchair. I was at the doctor’s office for my kindergarten physical. Who was in the chair? The doctor. (Polio) Then there was Dale, a young man who slobbered and walked funny. He taught me to dance the two-step. (Cerebral Palsy) I didn’t know the diseases nor did I know they were disabled. They were my friends. Earl refused and arranged my transfer to a spinal cord injury (SCI) rehabilitation hospital in Atlanta, Georgia. Once stable, off the ventilator, and using a power wheelchair I went to the gym. My neighbors and I shared our stories. We were alike. Back home no one was like me. Strangers and friends petted me and called me a “poor thing.” Many ignored my injury, as if it would go away, or ignored me, hoping I’d go away. I became angry and bitter. After years of struggling with the reality that I wasn’t going to be healed, and studying God’s Word, I learned that He didn’t call me to be an invalid. He called me to be Christ-centered and bold in my faith as I shared what He had done for me. Peter said it this way: “As each one has received a special gift, employ it in serving one another” (1 Peter 4:10). As we strive to reflect Gods nature, others will see God’s love in us.